Eagles OTA observations: Carson Wentz practices! The Philadelphia Eagles had their first full open practice in front of the media on Tuesday, and for an indoor practice, there was a lot to see. Here's what I saw. In my now sixth year covering the team, the only comparison I can make with Wentz is Sam Bradford, who the Eagles acquired during the 2015 offseason after he tore an ACL during the 2014 preseason with the Rams. Like Wentz, Bradford tore the ACL in his left knee. Bradford barely moved his feet during his reps. He had deliberate movements, whereas the other quarterbacks had much more natural-looking footwork. Any casual observer could clearly see a difference. He's slightly more mobile than a JUGS machine right now. We'll see if that changes as the summer progresses. Wentz was far more mobile in practice on Tuesday than Bradford was in June of 2015, despite having roughly four fewer months to recover. If you'll recall, Bradford played in preseason games, and of course was ready for Week 1 of the regular season. Pencil in Wentz for Week 1. • The first practice of the season is always good for getting a first look at the depth chart during team drills. The quarterbacks were (1) Nick Foles, (2) Nate Sudfeld, and (3) Joe Callahan. 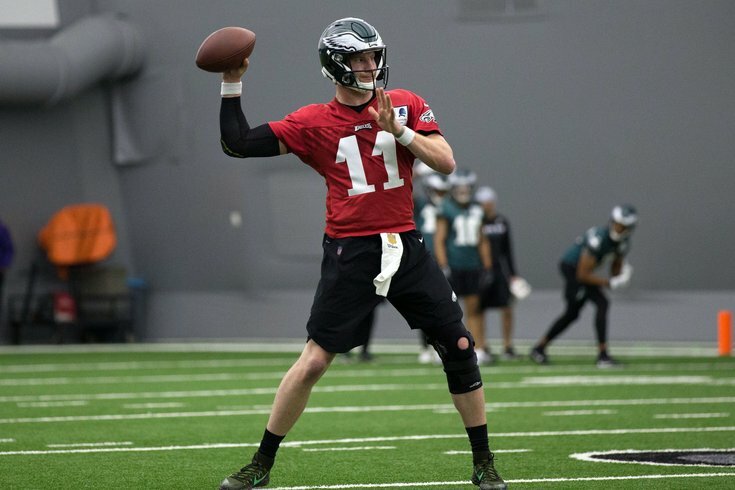 Wentz participated during individual drills only. We'll skip the skill position players because they cycle in and out so much. Isaac Seumalo was snapping during 7-on-7 drills, but he did not participate with the regular offense in team drills. We'll look into whether or not he is injured in some way. In addition to first team slot duties, Sidney Jones got some reps on the outside with the second team defense. Brandon Graham, Timmy Jernigan, Haloti Ngata, Jordan Hicks, Joe Walker, Mychal Kendricks, and Chris Maragos were the notable players who did not participate. • Darren Sproles and Michael Bennett were the only absentees, per Doug Pederson. He was not concerned about either player missing practice. Sproles has routinely missed Eagles OTAs in the past, as has Bennett in the past with the Seahawks. • The Eagles had their first serious-looking injury of the offseason. Recently acquired LB Paul Worrilow collided with Donnel Pumphrey, and went down in pain. He slammed his hand on the ground several times immediately after the injury. Trainers put an air cast on Worrilow's knee, before he was carted off. We'll update when we know more, but it didn't look good. • Speaking of Pumphrey, he's sharing a jersey number (34) with undrafted free agent safety Ryan Neal. If you read into that as bad news for Pump, I agree. • Wendell Smallwood fumbled in a non-padded practice, and was immediately sent off the field. The battle for the fourth running back job between Smallwood, Pumphrey, Matt Jones, and Josh Adams should be a fun competition to watch throughout camp. • New PhillyVoice sports editor Evan Macy (follow him here) made the astute point that three of the projected cornerbacks to make the team have dreads. They are Ronald Darby, Sidney Jones, and Avonte Maddox. If you consider that Jalen Mills has green hair, the only corner with no Madden hair swag is Rasul Douglas. Shame on you, Rasul. • Cornerback De'Vante Bausby had a nice day. He picked off a pass in the corner of the end zone intended for rookie tight end Dallas Goedert. Later, he had a nice diving pass breakup of another pass intended for Goedert. • And finally, we had a public display of affection at camp today.